All investors know the risks of biotechnology companies. The strong volatility of these companies makes their prices fluctuate in excess. This sector has the peculiarity that offers a high risk but with a possible high gain. Identify pharmaceutical companies that have bottomed out or that are undervalued can be a good investment strategy for medium-term and short-term. In the following table will be able to see the readers, 3 companies which have greatly reduced their quoted prices since on January 3, 2012. As you have seen in the upper table these companies have been hit hard during November, 2012. To determine if these companies are undervalued I have made a fundamental analysis of each company. Dynavax Technologies Corporation (NASDAQ: DVAX) is a clinical-stage biopharmaceutical company, discovers and develops novel products to prevent and treat infectious and inflammatory diseases. It develops product candidates based on the use of immunostimulatory sequences and immunoregulatory sequences. Dynavax's lead product candidate is Heplisav. This product candidate is in Phase III to treat adult hepatitis B. Heplisav is an experimental vaccine. On November 15, 2012 Dynavax announced that FDA Vaccines and Related Biological Products Advisory Committee voted thirteen to one that Heplisav data adequately demonstrated immunogenicity. But the same Committee voted eight to five with one abstention that there was insufficient data to adequately support the safety of Heplisav. Dynavax has a market cap of $489.66 million. Its trailing P/E is incalculable, and its forward P/E is just incalculable as the majority of pharmaceutical companies of small-capitalization. Dynavax' estimated growth rate for this year is 44.10%. It has a total cash position on its balance sheet of just $148.28 Million. The company announced a revenue on nine months ended September 30 of $7.90MM. This stock plunged from its May high of $5.34 to a recent low in November of $2.22. If you are bullish on this stock, I would look to be a buyer on the next high-volume move above some near-term overhead resistance at $2.91 a share. Look for volume that's tracking in close to or above its three-month average action of 6,547,844 shares. Horizon Pharma (NASDAQ: HZNP) is a biopharmaceutical company, through its subsidiaries, develops and commercializes medicines for the treatment of arthritis, pain, and inflammatory diseases. On Dec. 3, 2012 The company announced that its product called Rayos (prednisone) delayed release tablets are now available to U.S. physicians to treat a broad range of diseases, including rheumatoid arthritis, polymyalgia rheumatica, psoriatic arthritis, ankylosing spondylitis, asthma and chronic obstructive pulmonary disease. 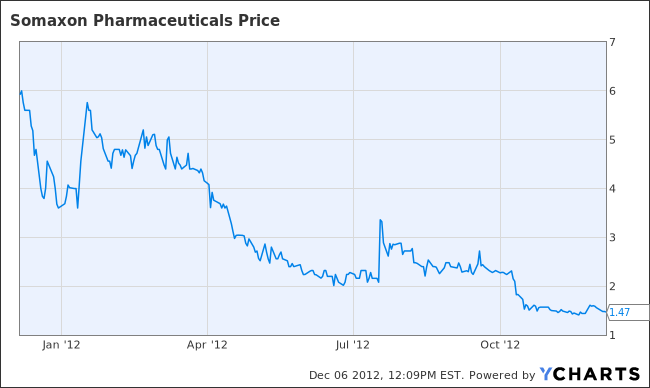 Horizon Pharma has a market cap of $141.04 million. Its trailing P/E is incalculable and its forward P/E is just incalculable as the majority of pharmaceutical companies of small-capitalization. Horizon's estimated growth rate for this year is -788.84%. It has a total cash position on its balance sheet of just $121.33 Million. The company announced a revenue on nine months ended September 30 of $12.88 Million. 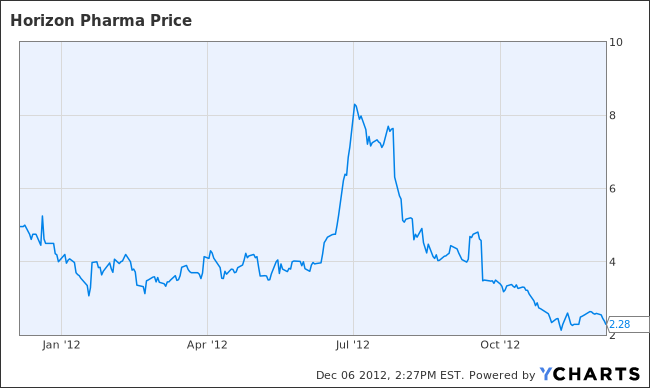 This stock plunged from its July high of $8.72 to a recent low in November of $2.03. If you are bullish on this stock, I would look to be a buyer on the next high-volume move above some near-term overhead resistance at $2.52 a share. Look for volume that's tracking in close to or above its three-month average action of 933,422 shares. Somaxon Pharmaceuticals (NASDAQ: SOMX) is a specialty pharmaceutical company that engages in the licensing, development, and commercialization of proprietary branded products and late-stage product candidates for the treatment of diseases and disorders in the fields of psychiatry and neurology. Somaxon has a market cap of $10.63 Million. Its trailing P/E is incalculable and its forward P/E is just incalculable as the majority of pharmaceutical companies of small-capitalization. Somaxon's estimated growth rate for this year is -10.24%. It has a total cash position on its balance sheet of just $8.5 Million. The company announced a revenue on nine months ended September 30 of $8.22 Million. 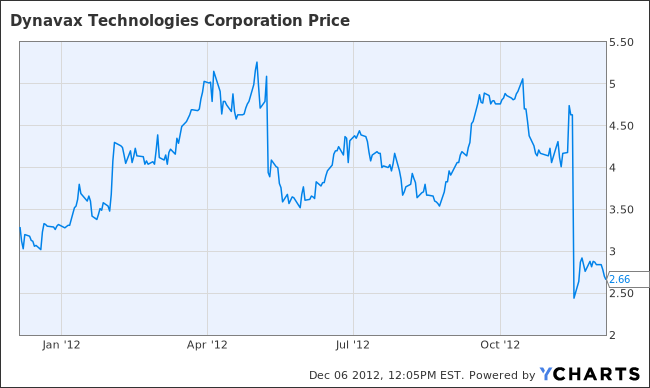 This stock plunged from its January high of $6.40 to a recent low in November of $1.29. If you are bullish on this stock, I would look to be a buyer on the next high-volume move above some near-term overhead resistance at $1.56 a share. Look for volume that's tracking in close to or above its three-month average action of 59,003 shares. This area really has quite a high risk factor. However, some aspects warrant this situation. This can be a good investment strategy. It looks like there was a kind of a huge change. I am not sure about the cause of those, but I definitely can see the result. I love this website, thanks for this article, it is one of the most interesting I've ever read but I have some additional data about it, follow the link and enjoy. such interesting facts, I did not know this before, now I want to know more, tell me where you get this information from.